You've heard of caramelised white chocolate, right? It's been popping up all over the place since Food 52 posted about it a few weeks ago. I joined in and made Caramelised White Chocolate Éclairs filled with softly whipped cream. Just the memory of them makes me feel a bit weak at the knees. One day when I was testing for the éclairs, I asked mum to get some extra chocolate from the shops. When she came back there was a bar of Frey Milk in amongst the selection, a sweet and creamy Swiss chocolate that she'd mistaken for a bar of white. So, ever curious, I decided to see what happened if I applied the same process to milk chocolate. For the first thirty minutes, nothing seemed to change. Then another flavour started to creep in, bit by bit. Once finished and cooled, it was quite different. It's not as big a change as with white, but I rather like it. 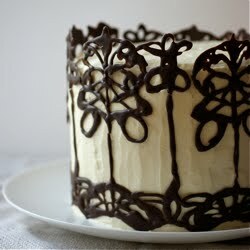 It's still sweeter and creamier than dark chocolate, but it's richer and more complex than usual. The difference is hard to describe - there's a touch of extra caramel, a bit of bitterness (even a touch of sourness in one of the chocolates I tried) and a roasted-coffee depth. The salt, as ever, heightens the flavours and takes the edge off the sweetness. Unlike white chocolate the colour doesn't change, though it does thicken a little. The flavour deepens as it cools. Given all the talk about how you need to buy expensive, professional brands to make caramelised white chocolate (certainly never pick something conveniently from the supermarket), I thought it would be interesting to see what people thought of caramelised milk chocolate made with a variety of different brands. I haven't organised a blind taste test since 2010. The first one I did was for chocolate hazelnut spreads, where I roped in four friends to taste Nutella, two other brands and a homemade version. Later in the year I organised a larger test for vanilla ice cream - four brands and two homemade versions tested by ten people. They're good, geeky fun - at least for me (though I've never had a complaint...). So I persuaded five neighbours to come round and eat chocolate for me. The six were all baked at 120C/250F for 65 minutes, stirring after the first five minutes and then every ten. I used 100g of each, except for the Valrhona, which was 70g (due to the packet size). As I wanted to do two at a time, I used glass dishes as I don't have two appropriate metal dishes. A pinch of fleur de sel was stirred in at the end of the process, before it was all scraped into a numbered bowl and cooled. Once firm, I sliced it into squares for easier tasting. As you can see, the rank is almost reversed in comparison with the price list. The Valrhona divided opinion, with two testers putting it last and the others ranking it highly (though only one placed it first). None guessed that it was the most expensive (I should note that if I had wanted to have a kilo of it, I could have reduced the price per 100g to £2.59). The G&B Creamy Milk behaved weirdly - it didn't seem to roast like the others and kept a milder, neutral flavour. The amount of cocoa and milk didn't seem to make a huge difference. The M&S has 36% cocoa and a minimum of 26% milk, very similar to the G&B Milk (34%, min 25%), whereas the Lindt has 30% cocoa and a minimum of 20% milk. The only ingredient that did make a visible difference was the amount of cocoa butter. The series of photos are of the Green & Black's Milk, which goes particularly thick when you roast it. Cocoa butter is the fourth ingredient in its list, compared with the fluid Valrhona, where it is the top ingredient. Interestingly, the M&S chocolate lists 'caramelised sugar syrup' as an ingredient, which probably added to the effect. Other common flavourings included vanilla and malt (though the Hotel Chocolat has no flavourings, presumably as it's for cooking). Obviously it's a small, imperfect test, but I think it shows that you can get a delicious result with a variety of chocolates. Perhaps it would have been different if I'd tried other brands or had a gathering of professional pastry chefs and world class chocolate experts around my table (but then when do I ever feed them?). I think that the caramelisation and salt makes the most difference to the cheaper chocolates, where the conversion of the pure sweetness to a richer, deeper flavour is most needed. For the moment, my tip is to toss a few chunks into a mug then pour steaming hot milk over the top. Leave for a few minutes, then stir or whisk together. It makes glorious hot chocolate. Okay, so this seems like an incredible idea and nothing I've ever thought of before. Taste testing... I feel a Summer dinner party idea formulating... My friends better watch out! What a great experiment and an excellent way of passing on your newly acquired knowledge. Thank you. Coincidentally, following your eclair post, I was at the shops this week comparing prices and cocoa butter content (where possible) of white chocolate. I know you need a high cocoa butter content and both you and the author of little loaf got good results with G&B. Have you tried Lindt? I am going to try rippling it through ice cream. It's a fun way to spend an hour or so - I make little paper slips so people can write their thoughts down. I'd love to hear if you do hold one and what you try/how it goes. I think dark chocolate would probably just get a bit bitter - it doesn't have much sugar to caramelise (and I think the milk itself changes too, possibly slightly like brown butter? Not sure, just a hunch). I often use G&B dark chocolate in cooking - and I found the white caramelised really well - but for some reason the milk just didn't work as well here. What sort of things have you found it behaved weirdly in? I have tried Lindt for the white, yes - it worked well (just be careful to get plain white chocolate - I kept on picking up bars with creamy middles and so on before realising!). Rippling it through ice cream sounds delicious - I've tried it poured over vanilla ice cream and it was lovely. Interesting with milk chocolate. I made the caramelized white with average supermarket chocolate because, I had some at home and was not using it, and I thought I might as well try the first time with a cheap one. It was incredible! Now I´m thinking if it will be better with an expensive brand. Nice post! I need to try this, it looks incredible! Such a cool experiment! And I'm sure it makes some friggin good hot chocolate. Can't wait to see what else you do with it! I'm going to have to go and buy some milk chocolate, though I've just stocked up on more white chocolate to caramelise. I made the white chocolate eclairs at the weekend and they were fantastic. Amazing how effective that tiny pinch of salt is. I had to make another batch straight afterwards they were so good. Looking forward to your milk chocolate recipe. After I tried caramelised white chocolate I wondered about the effect it would have on milk chocolate, I'm glad you took the time to try it out. All this chocolate caramelising makes me want to re-make every chocolate recipe ever! It makes sense that the milk chocolate gets less affected by the caramelizing because the cocoa powder in it helps masks the caramel flavours, whilst the white chocolate is more of a canvas. Also interesting that it seems like it's the chocolate with the most sugar that tastes the best (although I understand why, because the caramelizing affects sugar more than other things, right?) while it seems like the cocoa butter content matter more in white chocolate. Thanks for doing the tests, it was really interesting reading about it! I haven't tried any expensive brands of white chocolate yet, so they might be as superior as they say - I'm not sure if it maps across from the milk. & I loved your post about the caramelised white chocolate custards! I hope you do - it's fun to find new methods and flavours. I've been having the hot chocolate every night just before I go to bed. So good. I'm so excited that you made the eclairs and that they went well! I love that you made another batch immediately. Me too! I keep on thinking of all the chocolate recipes I want to try it with - though I've never baked much with white or milk, compared to dark. It's a fun after dinner activity, or teatime - or whenever, really. Glad you enjoyed the post. Thanks Greta, I hope you try it out one day. Thanks Nathalie, I found our comment discussion on the eclairs really inspiring. Sugar is the main ingredient in all but the Hotel C (though it groups both cocoas together, so if they were split, I reckon sugar would be top) and the Valrhona. It's quite a different change to the white chocolate one - smokier, darker, rather than caramel. Emma, love your scientific polling for the caramelized chocolate:) Very interesting to know that the cheapest chocolate ranked highest! That post smells of chocolate! Your house must have smelled amazing on the day...heaven. The best smell was when everyone was gathered around ready to taste and I whipped the covers off all the bowls - the smell that rose up was incredible! Yes! I did read about the caramelized white chocolate, and it's been on my to-do list ever since. Lucky neighbors of yours! I would've loved to be part of the taste test, as I am unfortunately not patient or organized enough to conduct my own poll. I'll just have to take your word for it. :) I'm eager to see what you do with it! Heya i'm for the primary time here. I found this board and I find It really useful & it helped me out much. I hope to present one thing again and help others like you aided me. I've just posted the recipe :) I hope you find someone on your side of the pond who wants to organise a taste test then! Thanks Jenny! I posted some espresso shortbread sandwiched with the chocolate last night, so no need to wait. Wow! This is beautiful!! That caramel milk chocolate frosting sounds out of this world!